Lilies are among the most beautiful bulbous plants, combining stateliness and grace with brilliant and delicately-colored flowers. True lilies are in the genus Lilium, which does not include many plants that use the word lily in their common name, such as daylilies, calla lilies and canna lilies. There are hundreds of species of lilies in the world and thousands of hybrids and improved cultivars available from specialty growers. All share a similar physical appearance, however. Lilies grow as upright stalks with tender, almost succulent leaves that radiate symmetrically from a common point every few inches along the stalk. The flowers, which generally appear in early summer, are always held at the top of the stalk and have a characteristic tubular or bell shape. Plant height ranges from two to six feet and flowers can be anywhere from two to six inches long though most varieties fall in the middle of these extremes. Flower color varies, but many varieties are decorated with exotic patterns of stripes and spots. 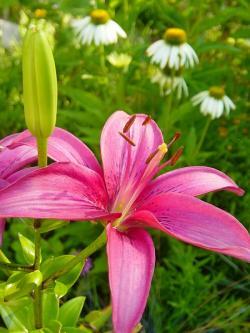 Lilies thrive with cool weather, well-drained soil, and an ample supply of moisture and nutrients. They flower most abundantly in full sun, but are better off planted where they will receive some afternoon shade in hot climates. As long as their growing requirements can be met, lilies are suitable for perennial borders, woodland gardens (planted near the edge where they will receive sun), cottage gardens, and large pots. The key to incorporating them in the landscape is to plant them where they will rise up from behind lower growing plants in the foreground. They have a brief blooming period, so it's helpful to mix them with other plants that will hold the space during their off season. Being surrounded by vegetation has the added benefit of sheltering the delicate stems from late frosts or early heat waves as they emerge from the ground in spring. Lilies can be found in nurseries as potted plants, ready to flower, but most often they are grown from bulbs planted in fall or early spring. The soil should be heavily amended with composted manure and sculpted into a low, broad mound if drainage is poor. The bulbs should be planted twice as deep as the bulb is wide with the tapered end pointing up. Plant individual bulbs six to eight inches apart in clumps of three, five, or seven for the best effect. Lilies are fairly demanding plants. They should be watered as soon as the top inch of soil is dry though excellent drainage is essential to keep the bulbs from rotting. 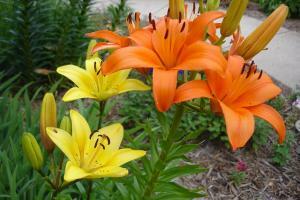 They also benefit from fertilizer, especially the modern hybrid lilies with enormous blossoms. Be sure to use a high phosphorus, low nitrogen fertilizer, such as 5-10-10; the first number on a bag of fertilizer is the percentage of nitrogen, the second is phosphorus. Faded flowers can be picked off to prevent the plant from putting its energy into seed production. Leave the leaf stalks after flowering is done, however, so the plant can continue to photosynthesize for the rest of the growing season and store up energy in the bulbs for next year. The stalks will turn yellow and wither after the first frost in fall, at which point they can be cut to the ground. Lilies will expand into a dense clump of bulbs and roots over time and should be divided every few years to prevent crowding. This is best done in fall. Simply dig up all the bulbs and replant them as described above. There will be many more bulbs than what you started with, including a lot of small ones. The little ones can be discarded or planted together to mature into flowering plants over time although it may take several years for the smallest bulbs to start flowering. Lilies require a lot of pampering but fortunately they are fairly resistant to pests and disease. Aphids are common on lilies, but are a minor nuisance that can be remedied with a strong blast of water or an insecticidal soap. Botrytis blight is a fungal disease that causes reddish-brown spots on the leaves and can slowly weaken the plants. It is exacerbated by moist conditions, so water in the morning so the heat of the day can dry out the foliage, or water your lilies at ground level (i.e., with a drip system or soaker hose) to prevent the leaves from getting wet. 'Stargazer' bears highly fragrant flowers on two to three foot stalks with white edges on the petals and rose-colored throats. 'Belo Horizonte' has yellow flowers flecked with brown spots and grows three to four feet tall. 'Mrs. R.O. Backhouse' has drooping yellow flowers flecked with pink on three to five foot stalks. 'Casablanca' is a late-blooming lily growing four to five feet tall with pure white blossoms. 'Netty's Pride' grows to three feet with with purplish-black centers and white tips on the petals. 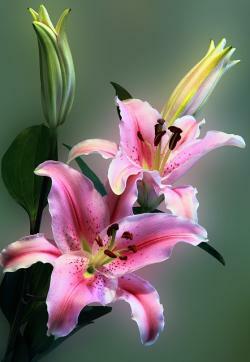 Lilies are one of the best cut flowers and a great way to express your appreciation to a loved one. 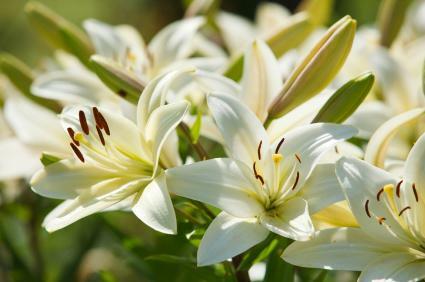 They have a lush, ethereal appearance and often, an intoxicating fragrance that have made many gardeners fall in love with lilies themselves.